SoCal Rentals was founded in 2008 to provide clients in broadcast, reality TV, live event production and AV/staging with full service audio, video and LED solutions offering production-specific engineering design, equipment rentals, expert technical management, project consulting and crews. 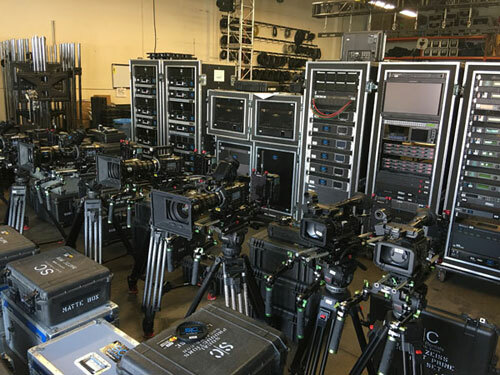 The company recently added 12 AJA Ki Pro Ultras into their rental pool, which already includes massive quantities of AJA gear including hundreds of FiDO fiber and Hi5 SDI to HDMI Mini-Converters, 30 Ki Pros, 20 Ki Pro Racks, multiple FS1 and FS2 frame synchronizers, KUMO routers and more. “We’ve always preferred AJA products for their performance. In the rental business, gear is truly put to the test and is constantly in rotation—our AJA gear has proven to be more durable and reliable, and their support is outstanding,” said Eric Broderson, Founder, SoCal Rentals. The company’s recent purchase of 12 Ki Pro Ultras will service broadcast clients working in 4K and UltraHD, “We’re building a 4K flypack and are using Ki Pro Ultras as our record source. Ki Pro Ultra provides a really inexpensive solution for 4K workflows and the way that two of them fit perfectly side-by-side into a rack is super convenient. The built-in LCD screen is a huge benefit and the upcoming Pak-Adapt-eSATA option and Avid DNxHD and DNxHR support are features we’re really excited about too,” Broderson continued. In addition to providing rental packages to reality shows that include “Teen Mom,” “Celebrity Rehab” and “Family Therapy,” much of SoCal Rentals’ business comes from live event ProAV setups for the MTV Movie Awards, the VMAs, the Grammys, the Kids Choice Awards and more. For live awards shows, SoCal Rentals has built and designed custom press bridges for signal distribution from the red carpet, press room, performance stages and more. These events often utilize hundreds of AJA FIDO fiber converters to transmit signals reliably. Live event production can be incredibly stressful but between our Ki Pro, FS and vast collection of AJA Mini-Converters we’re always able to find that “OBTW,” or as we call it, the “Oh By the way” product that delivers a quick fix when the deadline-driven world of live production presents us with a seemingly unsolvable workflow challenge,” concluded Broderson. SoCal Rentals will continue to expand their inventory of AJA kit as they plan to grow with a new location opening next month in Atlanta, and more soon to follow in San Francisco and Las Vegas. For more information visit www.socalps.com.